All one needs to do to get a grasp on the near-ubiquity of smartphones is to go out to a bar any night of the week. Anyone who is not actively involved in conversation (and plenty of people who are supposed to be conversing), can likely be spotted looking down at their screens, scrolling, pinching, and tapping the glass. And a new report confirms that the devices are not only as widely used as you’d suspect, but are approaching TV levels of popularity. The Consumer Electronics Association has released its data on the most widely owned tech devices in U.S. households, and this year’s list shows that smartphones continue to increase in use to the point where they are poised to become the second-most owned devices in the near future. 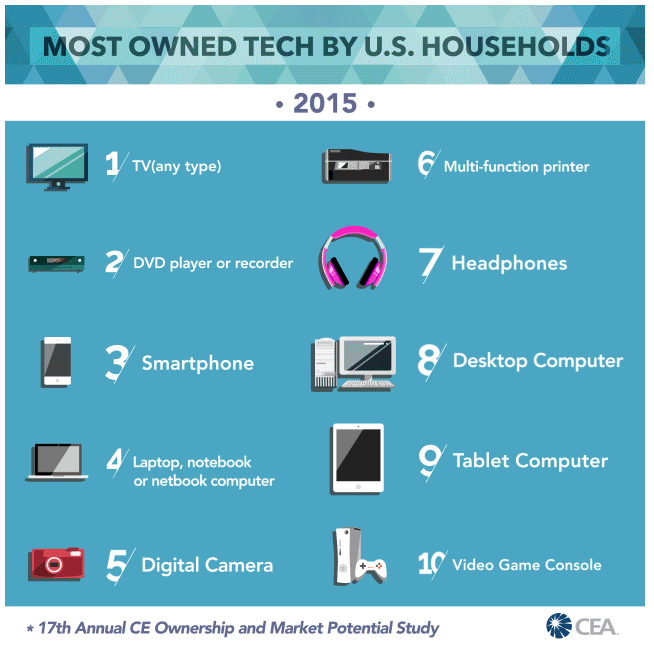 According to the CEA, smartphones leapt over both laptops and digital cameras to go from #5 on the 2014 list to #3 this year. In all, 72% of U.S. households now own a smartphone, up eight percentage points from last year. That puts the devices right on the tail of DVD/Blu-ray players, which are still in 78% of homes. While it seems inevitable that smartphones will soon surpass these disc-based media players on the list, TVs are still king with a 97% ownership rate. Of course, with smartphone adoption continuing to increase, it means fewer people are carrying traditional cellphones. These non-smart phones vanished from the top 10 list for the first time ever and fell to below 50% of households. Tablets gladly took that #9 spot from cellphones, jumping up nine percentage points to be found in 54% of U.S. homes to make their debut on the list. With the increased use of smartphones and tablets as media devices, it’s not a surprise that headphone ownership jumped up five percentage points to 59%, moving up one spot to #7. Wearable fitness trackers didn’t make the list, as they’re currently only in around 11% of homes, but that’s more than double the ownership of just a year ago. Streaming media devices like Roku or Apple TV that let you bring things like Netflix and HBO Go to your TV are also continuing to become more popular and can now be found in 29% of homes, up from 24% in 2014. Should Pre-Teens Be Allowed To Own Smartphones?